Alright yesterday I did part one of this analysis which you can read here. It went over digital comic creator motivations, and what they believed some of the strengths of the medium are. But because we want to be fair and balanced, we’ve definitely got to talk about the weaknesses inherent in digital comics. If you haven’t read the interviews that I’m talking about, well what are you waiting for? I also interviewed Becky Jewell from Graphicly, to get the lowdown on their services and what they can offer to digital comic creators. Becky provides an awesome industry perspective and highlights publisher goals and the emerging trends in the digital books market. So Much Material Out There: It makes sense that, because of how easy it is to get a digital comic up, there’s tons of material out there for readers. How do creators set themselves above the rest? How do they make their comic stand out? Creators have the same problem in the print domain, but I think the issue is compounded on the Internet. It’s definitely a major hurdle out their for neophytes. Must Learn Ins and Outs of an Entirely New Market: Do you want your comic to be successful on the web? How are you marketing yourself? Are you leveraging the right social media platforms? How does your website look? Are you responding to fan emails and blog comments? Do you have an active Twitter profile? Are you meeting new creators in digital spaces? Are you constantly networking networking networking? Not only is the internet on 24/7, but it’s very “choose your own adventure.” There are no rules for guaranteed success, and when experience is the best teacher, you’re bound to fail quite a few times while coming to grips with this new system. Where are the Profits? Where indeed! Unless you’re a well-known comics creators, or someone with an absolutely rabid following, it’s not likely that you’re going to be seeing a steady flow of cash from your comics. Jim Zubkavich, the big brain behind the totally fun Skullkickers from Image, wrote a great piece that breaks down the financial realities of indy print books. It should be required reading for anyone looking to get their mitts dirty with comics. He wrote another piece breaking down the fiscal madness of digital comics too, and again, it should be required reading. Jim shows wear the money goes, the percentages, the whole shebang to the best of his knowledge. You can absolutely make money off of digital comics, but again it takes work and dedication. These aren’t short term gains we’re talking here. Digital Comics are so New: Jim talked about this in his post, but digital comics are new and there’s not a lot of data out there to analyze and figure out best practices. Companies aren’t releasing sales figures so no one really knows how well these comics are doing. You’ve gotta carve your own path and that can be terrifying, but rewarding too. When it comes to choosing a digital comics publisher, you want to work with a company that takes advantage of all the medium’s affordances while navigating it’s weaknesses. The majority of my interviewees worked with Graphicly, and Becky actually works for Graphicly, and they all seemed pleased with the experience. They help provide exposure by connecting books to Amazon and the iBookstore among others. They publish material quickly. From what I’ve heard, their customer support is top of the line, though the interfaces for some of their programs could use some work. They allow creators to see analytics and take direct control over their reader’s viewing experience with panel by panel transitions. I’ve never personally used Graphicly, just spoken with people who have and it seems as though they’re doing good work for the comics crowd. That being said, are there some aspects of digital comics that are out of both creator and publisher control? Some unexpected problems that have arisen with regards to the technology, the culture, or just the way that we read comics? That’s what I’ll be addressing in my next post, complete with video! Stay tuned folks! Over the past weeks I’ve had the incredible opportunity to talk to multiple awesome creators about their digital comics work. We talked about their motivations, the services they used to get their books out there, the strengths and weaknesses of the medium, and so much more. Now I want to distill some of that conversation into something that we can use, something that shows how creators are using digital comics, their needs, and where the medium is going. If you haven’t read the interviews that I’m talking about, well what are you waiting for? Be sure to check these bad boys out and head over to the creator’s sites to see what they have to offer. I think it goes without saying that those people out their creating comics, they have a passion for storytelling. The creators that I talked to all had this passion, but they had different reasons for working in comics and making that jump to digital. Some, like Michael Koch, felt that their material was unpublishable and not mainstream enough for the established publishers to pick up so they decided to tell their stories digitally. Joe White wanted to see one of his film scripts brought to life and used comics. Others, like Sara Simms, saw comics as a way to combine a variety of artistic and local influences with her professional persona and create something totally unique. Ed Dippolito wanted to tell stories, but autonomy has to be a part of the package. What’s his is his, and digital publishing allows for those sorts of affordances. Chris Charlton wanted to create a body of work for people to see, whether they be fans or potential employers, and supplement his print comics work. A ton of different motivations right? Well how did the affordances of this particular medium help fulfill those motivations? Each creator had their own view of the strengths and weaknesses of digital comics and I think showing these off is something that will help us understand what the medium offers, what works well, and what can be improved. Ease of Entry: Anyone can publish a digital comic once they’ve gotten something on paper. Many of the services that help publish digital comics, Graphicly for example, only require a modest fee and your digital files. They take your work, convert them to whichever format a platform requires and they actually distribute the comic for you. Just sit back, relax, and watch as your story hits Amazon, the iBookstore, and other popular digital marketplaces. All creators are responsible for is crafting a great story. Cost Effective: Compared to print, digital comics can be a lot cheaper to distribute. Companies like Graphicly and Aquafadas, depending on your service choice, only charge an up-front fee. Granted you get a huge chunk taken out of your profits by distributors, but that’s the same for print. No printing costs, and unless you feel like it, you don’t have to go to conventions peddling your wares. It’s probably a good idea to hit the convention circuit, it’s all about who you know, but you don’t have to. Short Time to Market: While the act of actually writing, pencilling, inking, and coloring a comic obviously takes a crap ton of time, printing and distribution can add months to your release date. With digital comics your finished pages can go live in as short as two weeks! Much Longer Shelf Life: Digital comics, unlike their print cousins, never have to go out of print. This means that readers who caught on to a creator’s later work won’t have to wait for a trade paper back or comb through the quarter bins at the local shop for the early stuff. It’ll be right there for them to purchase, whenever they feel like it. Exposure: Even if you had the power to go to every single convention, you’ll never get as many eyes on your work as the internet could potentially provide. The internet grants access to markets and audiences that you never knew existed. It provides a space for to brand themselves and their work, to create a home base for fans to gather, and a offers a whole slew of different ways to communicate across industries and continents. It allows easy access for fans, fellow creators, editors, and publishers who may be interested in your material but aren’t anywhere near your geographic proximity. Synergy: Chris mentioned that the sales of his print stuff have gone up since introducing free digital comics into the mix. There’s an opportunity there, especially with the innovations provided by print-on-demand services. Get readers hooked on the free stuff so that they’ll want to support you and pay for your other work. Comics are still “collector’s items” and until we forget what it feels like to hold a comic in our hand, forget that special smell, people will be willing to buy print work. Why not get them hooked on digital first? Adds Legitimacy: The best thing creators can do for themselves if they want to make it in comics is, you guessed it, make comics. Once you’ve done that you’ve got a leg to stand on when you start pitching your tales to established publishers. You’re not longer Random Joe with a story about fairies, but you’re Joe Spinelli, that guy who’s done great work on that cool digital comic Fairy Fire. The Future: In an increasingly digital world, and with the increasing ubiquity of tablets, ereaders, and smart phones, what creator wouldn’t want to ride this wave? Learning what it takes to thrive in an online environment now will prepare creators for the rapidly changing face of publishing and better situate them for this brave new world. WHEW! Alright team, that’s it for the analysis tonight. Next post, I’ll be talking about the weaknesses of the digital comics market, so don’t think that the world of digital is totally rosy 24/7, and why our creators used the services they did. It should be a blast so stay tuned! Next up in I Speak Comics’ Talking Digital Comics series I got a chance to talk to Ed Dippolito, the big brain behind Frank N. Stein, an original series whose first issue just hit the digital marketplace through Graphicly. Ed agreed to share his thoughts on the world of digital comics, his own experiences in the digital realm, and how Graphicly helped get him where he needed to go. I Speak Comics: What motivated you to create a comic? Is it a hobby? Do you want to make it a career? Ed Dippolito: First and foremost, I like to tell stories. I always knew I wanted to tell stories for the rest of my life yet I was always unsure of the medium I would go about giving birth to these ideas. I contemplated between film, animation, novels and even video games as a possibility to tell these stories. Yet the one thing I knew I wanted from the beginning, total control, which is something I may have had to compromise, was I to take one of those “grand” methods. Then one day my brain subconsciously raised my hand and whipped it across my face which somehow implanted the obvious. Comics! Since I could remember comics were always a part of my life. I had a great amount of respect for comics, which were often the source of many great movies, video games, television series, etc. 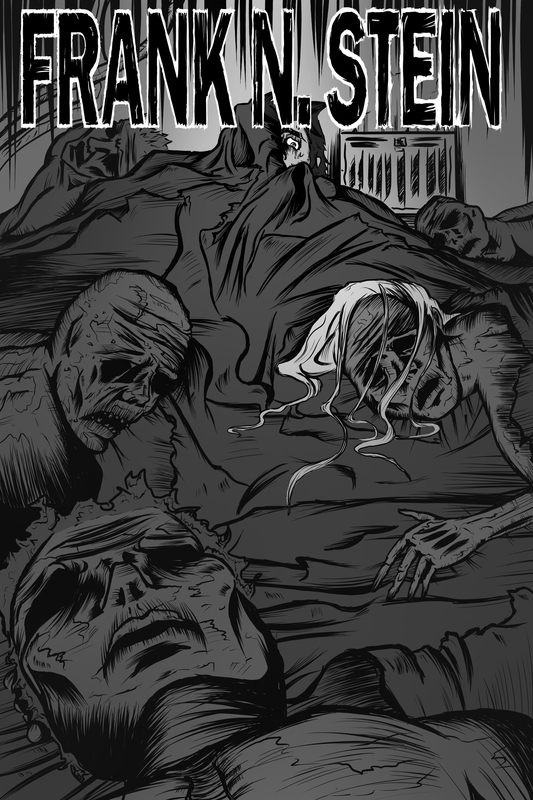 I knew starting my own comic entirely by myself was going to be hard work, but if it meant I solely have the control I originally sought after then I would gladly take on the challenge. I am finally getting the chance to tell the stories I’ve always dreamed of telling. No, it is not a hobby, I have big plans to take my comic, FRANK N. STEIN to the limit. Which means the amount of time needed to work on it is quite demanding. When I first started the comic I was working as an Animation Director in New York City which was also very demanding of my time. Realizing that I could never fully devote the amount of time I felt necessary to the comic it became aware to me that were I to truly make this dream happen a choice had to be made. I decided to take the risk; I quit my full time job and began the path to FRANK N. STEIN. ISC: Why did you choose to publish through Graphicly as opposed to other services? Why go digital instead of print? ED: I chose to publish through Graphicly after reading an article about the company making a change. They decided to shut down their comic app and instead focus on getting self-published comic creators seen. After reading that article I really respected the Graphicly team for such a genuine approach to helping us indie guys. Whereas most of the other digital publishing services seemed to handle things the way Graphicly used to, by having to purchase books through their particular apps. I also read a lot of forums and Graphicly had a really good reputation and seemed to be the number one pick amongst the community. That in itself spoke to me, if you ever want honesty, head to a community forum. There will never be anything like holding a fresh, store bought comic in your hand, and originally I always saw myself going the print route, but there were just too many pros to going digital. The most important being cost efficient, which of course is a huge thing and I really didn’t want to start out in debt. Another pro being the amount of ease there is to the whole procedure. All I have to do is upload my files and let Graphicly do all the work. Then there is the “Graphicly Dashboard”, which keeps records of important things, like how many times your book has been opened to even a monthly sales report. I can also appreciate the fact that Graphicly is connected to Facebook and Twitter, which I believe creates a huge convenience for anyone interested by allowing people to share and comment on your comic. All contributing factors to help you build a bigger audience! ISC: Which path did you choose to publish through? Web, Ebooks, or Apps? Was it cost effective? Are you seeing any return on your initial investment? ED: I published through both Web and Ebooks on Graphicly. It had only cost me $150.00 to publish the entire issue which is now being reviewed by those particular ebook carriers. Compared to what I’d have had to pay going the print route, it was absolutely cost effective. As of now I am only seeing little return through the web on the Graphicly App while the ebook is being reviewed. ISC: In your eyes what are some of the strengths and weaknesses of Graphicly? Digital comics in general? ED: A major strength of Graphicly that I’m quite fond of is that once my comic is on sale through the multiple ebook carriers, the potential amount of audience I’m able to reach out to is massive. As well as once it’s live there is no mention of Graphicly any longer, you are put on the ebook market and you have full control over your product. Although I believe there are some things that could be changed in order for me to have a slight bit more control over my comic and it’s pricing. One change being I’d like to be able to gift my comic to anyone I choose, say a family member or friend that I’d like to show my comic without having them buy it. I also would like to be able to advertise within certain channels and provide a promo code or something to help give an incentive to possible begin reading my comic. Not to mention I wouldn’t mind a slight tweak to the interface, the way it is now is a bit messy while navigating around. Other than that I have to say I believe Graphicly to have a fantastic thing going for them and I thank them for their efforts in helping me get the chance to make my story heard (or rather read). Indie Comic creators are really getting a great opportunity to break out on their own and get to do things on their terms. Like I said before, there will never be anything like holding a store bought comic in your hands and physically turning that fine, crisp page onto the next and continue to unveil the story. Maybe it’s the link to my child hood that brings great memories each time I read a new comic or just my personal belief. I believe there will always be room for the printed comic but for many people the thought of going out on their busy day and to the comic shop to purchase a comic just seems inconvenient. Let’s face it, we are in a digital age and we all need to embrace it. With tablets and smart phones being on us at all times, convenience is at the touch of our fingers and I can appreciate that. ISC: Did you ever consider making Frank N. Stein a web comic? ED: For a second, but quickly disagreed the thought. I knew from the beginning I wanted FRANK N. STEIN in the traditional comic format. ISC: Do you plan on publishing more books through Graphicly? In your opinion, could being a digital comic creator become a career? Where do you see the future of the medium? ED: As of now, yes. I’m still in the very beginning stages with Graphicly so it’s a little difficult to answer. Overall I’m happy with their service. I suppose I’ll have a much better idea within a couple of months because there’s no doubt this is going to be a slow start. Comics are a business and just like starting up your own business it takes a lot of persistence and patience. I do believe being a digital comic creator can be a career. Large publishing companies were necessary years ago when individual comic creators were unable to broadcast on a mass scale, but that time is over. With the internet and Grapichly’s service they are allowing you to do just that, reach the audience you need to let them know you exist within the vast sea of comics. It rests entirely on your shoulders to advertise and do whatever needs to be done to turn this business of creating comics a career. It’s going to be extremely difficult but is it worth it? My answer, absolutely! For the chance of telling my story I’ll throw everything I’ve got towards that goal. I believe the future is very bright for digital comics. With tech developers creating devices that fit our personal needs on every level, more and more people will own these devices which in turn do nothing but help us creators reach that many more people. I believe this is only the beginning of the digital comic frontier, there is much more room for improvement and there is no doubt in my mind we will see some great things from people who’ve got wonderful stories to tell. 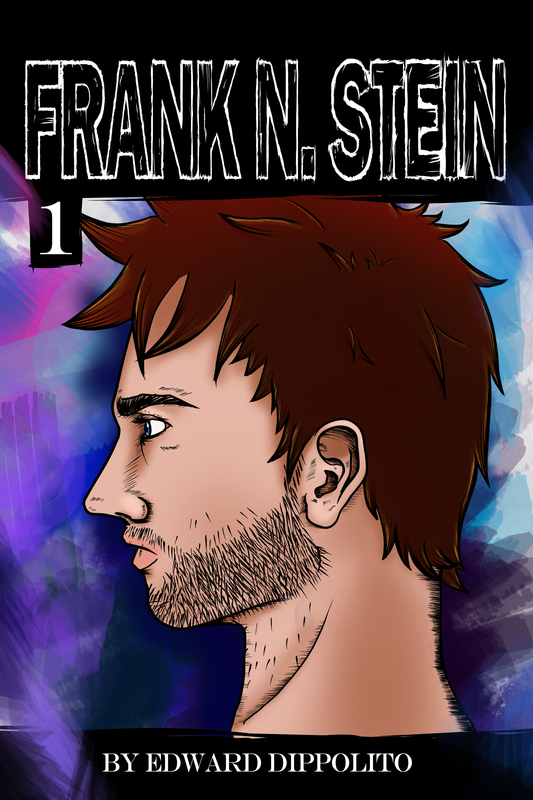 Ed Dippolito is a comics creator and mastermind behind the new series, Frank N. Stein. You can follow him on Twitter at EdDippolito and be sure to like the Frank N. Stein Facebook Page too!